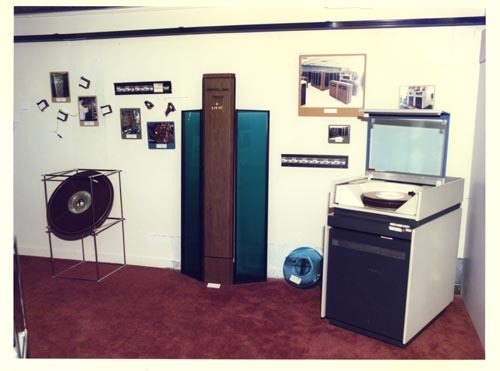 Color image of a Lawrence Livermore National Laboratory exhibit at the 1984 National Computer Conference. In the center of the image is a panel withj Control Data 7600 S/N 107. To the right is adisk drive with cover open to show the disk pack. Beside the drive is a disk pack with cover. To the left is a large disk platter in a display stand. On the wall are several pictrues of systems.